Sometimes changing the look of your grounds is a major job that requires excavation and land clearing services. L.I. Elite Lawncare can help. If you have a property that’s become run down or overgrown, It often makes sense to bring in an excavator and clear out soil and debris. L.I. Elite Lawncare can take down trees and bushes and clear land for both residential and commercial lawn care. 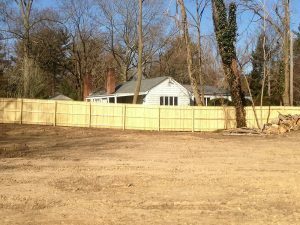 We’ll do this work throughout Long Island and get your grounds ready for a complete redesign. We remove the soil and make sure it’s at the right level for the upcoming landscaping project. We’ll also haul away excess dirt and debris. L.I. Elite Lawncare has access to state of the art excavation equipment. We’ll usually bring a compact excavator, consisting of a tractor with a backhoe or other attachments. The equipment allows us to maneuver easily through the property to clear things like dead trees and bushes. If you’re a realtor or a real estate investor trying to “flip” a house or looking to make a profit off of a property, transforming grounds that have seen better days can work wonders. 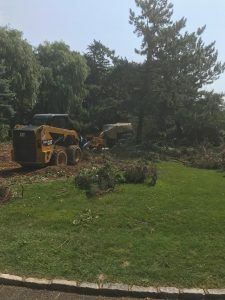 Excavation and Land Clearing is the first step towards a new landscape design which can increase the property’s value. The end result for your home or a commercial building is great curb appeal. We want the buyer to walk through the front door knowing that no extra money has to be spent on the landscape of the property. L.I. Elite Lawncare can do excavation work at a reasonable price, and if you need someone to do the landscape design, ask us about that too. We’ll explain every step of the project to you and take care of everything. It’s easy and affordable and you’ll get the professional service L.I. Elite Lawncare is known for, to maximize your profits. Contact us today!